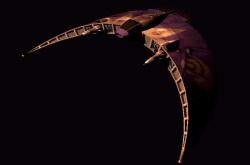 Description: The Primus Class Battle Cruiser is the main offensive weapon of the Centauri Republic. It is a bit less than 1 km long, but while not as large as a Narn Star Cruiser, its weapons power is similar. The ship also has a jump-point generator, and there is artificial gravity on board. Description: The Vorchan Class War Cruiser is smaller than the Battle Cruiser, but quite deadly. It is not known weather they have artificial gravity on board, but they are jump-point capable. These War Cruisers are also quite maneuverable, and capable of some atmospheric flight. The main body of a Vorchan Class War Cruiser has forward pointing "wings" sticking out on the top, bottom, right, and left side. 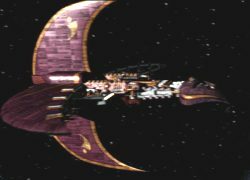 The front of the ship has a beak-like shape where the main weapon is located. These War Cruisers mostly attack in groups of two or more. Description: The Sentri Class Medium Fighter is a very large fighter, at least 30 meters wide. It has two cannons of some particle type, located on both side of the cockpit. 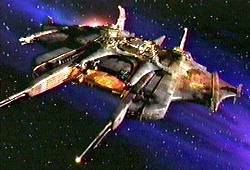 The Sentri Class also have a crescent shape, with the end of the "wings" tilted down. It is a very maneuverable fighter, but it does not have any artificial gravity on board.